Furumachi of NAGAWA (formerly Nagakubo Furumachi) located in Yutaka Furumachi 受大 of Shrine annual festival is known as commonly known Otaya Festival. Its origin at the end of the Edo era, the document of 1828 years (1828) is, but at the moment has been left as the oldest record, festival is considered to have been made from quite older than this before. 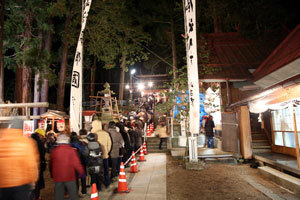 In Yutaka Furumachi 受大 Shrine following the Ise Shrine, is performed Senza festival every 20 years, annual festival will take place until noon of 15 days from the evening of January 14 every year. Home to some of the customers are, to this day in the beginning of the year, has a to and the departure of its age and Narawashi. People of pilgrimage Ueda, also visited from Saku district, turnout of about 4 to 50,000 people in these two days is expected. 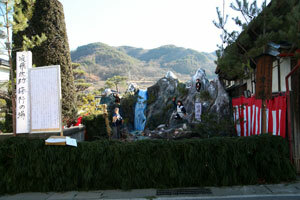 The Otaya Festival, when the people of life comes out a stable margin, now float is dedicated to actively the festival, is described in the diary of the 1835-year old family holdings (1835) users had, "Onta (journey) ya notice and ranked, decoration materials several places busi- Shinya" sentence of that there is a record of the oldest floats you know now. As a valuable traditional culture floats are to be handed down a rustic peasant art, is specified in the Nagano Prefecture intangible folk cultural asset selection in 1963, it has been dedicated by 5 location of the Preservation Society of current ward unit. Shinshutorii(Torii)Pass(Mountain pass)Of (Ueda)At the foot(Bottom)Boy named Sasuke was in. Although such as monkeys and deer have been flying every day to the other party, when it is ten years old, "the world can get ahead in the arm as soon because it is the era of the Warring States. Limited to the martial arts is to polish the arm." And martial artsTraining(Keiko)The began. On one occasion, such a situation is one of the gray-haired old man was looking at. The name of the old manTozawa(Tozawa)white(foil)Unsai(Unsai).Ninja art(Ninjutsu)White Unsai which was called the large master of, looking for those who bestowed their ninjutsu, here the boy SasukeHeading(Miida)did. White Unsai feel to avid try to agile movement and martial arts of Sasuke, and his disciples. Sasuke is this ToriitogeQuirky(Freaky)Nightly from an old man every day,Single-mindedness(Single-mindedness)I learned the art of invisibility, martial arts. ThatWorth(Or)There are, became an only slightly three years Admirable skill. White Unsai's ninjutsuEssential point(Secret)After tell, it went away flew to the east along with the Baiyun. Then, in Toriitogeboar(Lion)Hunting(But)Yukimura Sanada who came toNobushige(Nobushige)) Public and met Sasuke is, serve given the name of Sarutobi Sasuke than YukimuraKo, as the largest of the Sanada Ten Braves, was very active in the world of war. It should be noted that, of the nearby ToriitogeKakuma(Kakuma)Valley(Valley)The (Ueda), there is a rock to convey a Sarutobi Sasuke still has the training of ninjutsu. Filled all the moat of the castle in the Ieyasu Tokugawa of strategy,impregnable(Impregnable)Also of Osaka Castle has become a nearly-naked castle. Osaka Toyotomi who in the summer of Jin is forced to fight out of the castle,Keicho(Listening)Twenty years (1615) of May six days battleCover for gun barrel(Cover for gun barrel)I was dropped off. Toyotomi person,Goto(Goto)or(また)Hyoe(Bay),Usuda(It pampas grass)and(I guess)phase(Yosuke)Luo to die in battle,Kimura(Kimura)Shigenari(Shigenari)Even killed, Sanada Corps to have been doing late there hit the army of ten thousand Date, after having defeated thisPalace(Palace)The beautifully served, we were pulling up to the Osaka Castle from Jizodo Honjin plains. Yukimura reading and is definitely Ieyasu if army is Saleh put the Honjin to Jizodo, planted explosives in Jizodo when to withdraw. Sure enough, Ieyasu was Honjin the Jizodo not know that explosives are planted. And, Sanada corps Sarutobi Sasuke et al ten mighty could have put fire to the fuse of one after another is sure to allow suitable time explosives. Then large acoustic Totomoniodo isBreak into small fragments(Break into small fragments)We are blown away to. Chisho Yukimura ofResuscitation(Resuscitation)It was of Issaku, but Ieyasu fled the lucky flame because it was by adding the use in the grass away from this time temple. 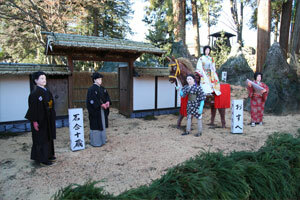 Sanada corps looked for Ieyasu to rush to again Honjin, but had gotten escaped without a figure. Secret plan of Yukimura who continued to follow the general Ieyasu just one of the enemyBroadcast(peel)It did not crack. Famous Momotaro of the story in Oni is, remains in the various parts of Japan, setting of the story is also different by region. Original story of this story is said to be in the previous era Muromachi, hero of the model, the oldest book in Japan "Record of Ancient Matters(Beggar)A person on the myth that appeared in "Kibi(Kibi)Country(Country of)He was active in the subjugation of (Okayama Prefecture and Hiroshima Prefecture, Kagawa Prefecture, part of Hyogo Prefecture)Kibitsu(Kibitsu)Yoshihiko(Rubra)life(This only and)View that has been a widely known. Fairy tales and picture books, are you fixed by the nursery rhyme, the old woman who was washing in the "river, take home a big flowed peach to house, and try to divide the old man, the boy appeared from among the peach. 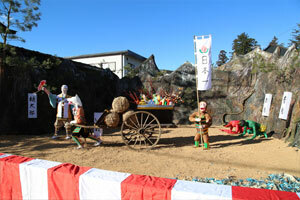 the child is named Momotaro, was carefully nurtured to grandfather and grandmother. is splendidly Momotaro grown, hanging millet dumplings to the waist, the demon to OnigashimaConquest(Conquest)Toward the. Along the way, dogs, monkeys, pheasants becomes a servant, it was getting rid of bad demon. Story is about. " A company, "What are the fairy tales and folk tales that you want Telling Live Lessons for children." Intended for parents result of the questionnaire that, "also be difficult in one person, that confront along with the fellow, you can achieve the purpose It is became the first place because of the like can be. "which transferred from the story that was" Momotaro ". 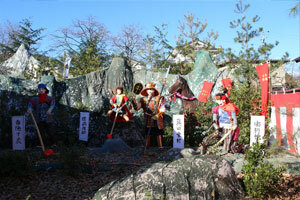 In this way Momotaro, also from the parent, also is familiar from the children, it says that story timeless know anyone. 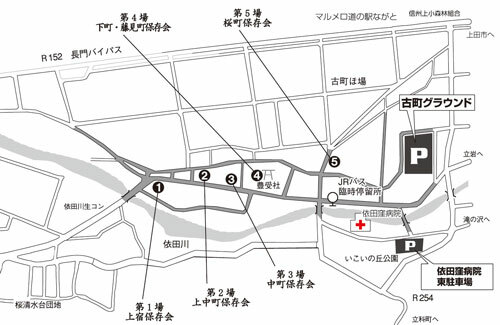 Now toRun -(Retroactively)RukotoMediocrity(Oyo)Its 400 years, Sekigahara battle of decisive have been performed. Sanada was Mukaeu' the Hidetada Tokugawa forces in Ueda castle as Western troopsMasayuki(Masayuki),Nobushige(Nobushige)(Yukimura) father and son has been a large fought in history, winning the Tokugawa who Higashigun in Sekigahara. Nishigun's defeatUi(Cormorant)Saw come first. Nobushige of the eldest daughter, Osue (Omonekiku(Okiku)) Is,uncle(uncle)(Or(ある)There is also reportedly grandfather. Is a)Hotta(Dug)Work(Bloom)Hyoe(Bay)Becomes the adopted daughter,Stone case(Stone love)Juzo(Juzo)road(Road)Constant(Sada)To the originalMarry(Or)It became Succoth. Ishigo Juzo's chiisagata district NagakuboSquire(Squire), And the Ishigoka will be serve the Honjin of Nakasendo Nagakubo-shuku after. Although the details Osue of prehistory that married is unknown, I wonder Nobushige became a defeated general is not that the end was worried about the only daughter. Osaka after the winter of Jin, husband-Juzo is, Nobushige,Daisuke(Daisuke)Is worried that the father and son, Nobushige, the Osaka Castle with Daisuke father and sonbasket(Also this)That sent a letter to Sakube, Hensho from Nobushige is transmitted to now against it. "此世 interview at (this I) is Yu Mashiki (Majiku there this) weather, everything also FuKano (beat forced) in mind that to be trick climate both, (unjust come forsaken) Noriyuki your look 捨無YoriyukiIri to visited with (Tanomiiri) weather. " That faces the decisive battle of the Tokugawa how fully prepared to die if necessary, deep for daughterBe affectionate(Enshrine)Kokorone of stain is wording transmitted to take in hand. Then, Osuewa, are said to have lived happily ever after. Warring States period lastGreat war(Oh sword? ), Its name in the world in the Siege of OsakaRoar(Roar)Tactician of legendary skein there were.Eiroku(Eiroku)Ten years (1567), small daimyo Sanada of ShinanoMasayuki(Masayuki)Sanada was born as the second sonNobushige(Nobushige)It is (Yukimura). Keicho(Listening)Nineteen years (1614) winter, the castle Osakabasket(Also this)Tsu wasToyotomi(Toyotomi)Tokugawa person surrounded the castle in two hundred thousand troops to the way hundreds of thousands. 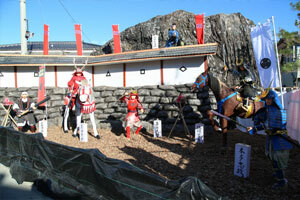 Yukimura, Shirogai southeast to the most fierce battle is expectedfort(Fort)It was built. Best tactics of the Sanada family tradition to lure the army of Tokugawa various CorpsJie(Kicking)Work(Bloom)It is "Sanada Maru". December four days, overwhelmingly people Tokugawa outnumber finally on top of the eye ofBump(Kelp), Surging to Sanada round. Yukimura did not miss this opportunity. Peppered the ferocious fire in a calm helm, it was defeated terrible to hit the Tokugawa various corps. However, it was not possible to overcome the war situation Even with this great victory. Already it is possible to obtain a victory aim in a desperate situation one neck of Ieyasu Tokugawa. 1615 years (1615) in May seven days, Sanada, led by YukimuraAka備(Akazona)For example Corps places a total attack on Ieyasu Honjin. DeathBetting(と)The onslaught of Yukimura Tokugawaflag(flag)A book(Source)Masses(Zhou)TheMiser(Stinginess)Rashi, was enough to ready a temporary Ieyasu to hara-kiri. It is Yukimura who perpetuate their own believe in the way, "SanadaDay(Hino)A book(Source)一(Ichi) OfSoldier(The strong)"WhenReferred(Very much)It will be Erareru. It has not been possible to get the glory alive, but also continues to live now become one of the legend.